Hot on the heels of Around the World in 80 Flights and Pole to Pole, the team at First Class Simulations continue their series of highly popular flight adventure packages with the announcement of Discover Europe. 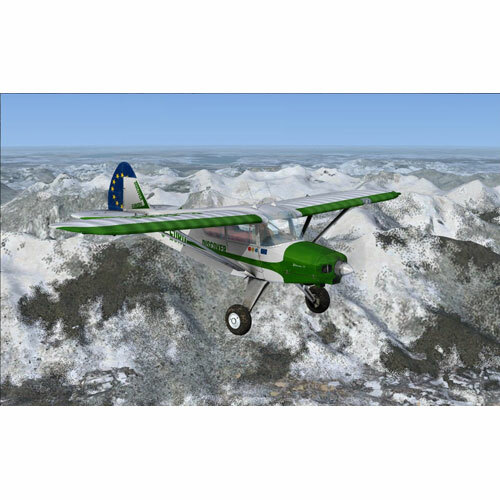 Fully included in the package is a detailed rendition of the Piper Pacer which First Class Simulations state has been carefully crafted by a team of professional enthusiasts to be the ideal accompaniment to the journey. Offering both maneuverability and benign handling characteristics the Pacer is a stable platform that is particularly well suited to the role of a sightseeing aircraft. The package invites us to take an Alpine adventure, to put our piloting skills to the test over the Pyrenees. Following the tour affords the opportunity to visit Paris, Rome, Madrid, Venice, Prague, Warsaw, Vienna, and a whole host of countries and cities that reflect the multicultural tapestry of the continent. With a range of flights for both novice and seasoned aviators the developers hope that there is something for everyone, from challenging approaches to a leisurely Mediterranean descent into the playground resorts of the rich and famous. The adventure is supported by lavish extras including a tourists guide to all the destinations visited, detailed pilots notes, a comprehensive briefing and a tutorial for the included Piper aircraft. Available for FS2004 and FSX, First Class Simulations aim to release Discover Europe ahead of Christmas 2009, so we can pack our virtual suitcases for a seasonal vacation!